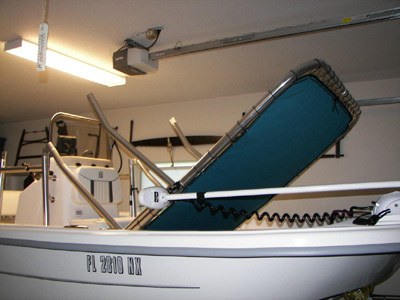 The Fishmaster® folding T-Top does not fold down below the windshield grab rail height in many cases, due to clearance isues with the cooler or the bow rails. 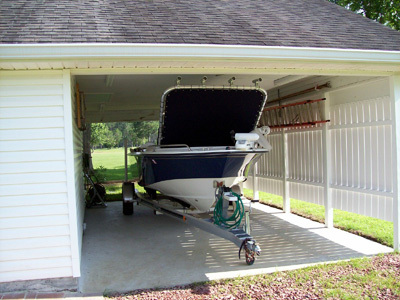 This can create issues with many garage doors if the boat barely fits through any way. 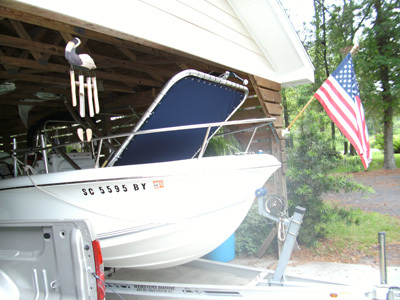 In addition, a standard boat cover may not fit due to the increased height of the folded Fishmaster® top. 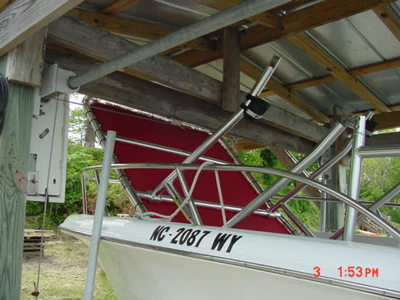 The Fishmaster® T-Top mounts to the floor with Wood Screws. This can be an issue, as the wood screws tend to work loose over time, even when "glued" in with 3M® 5200 sealant. It is our opinion that floor mounted T-Tops should be factory installed, where backing plates and thru-bolts are used, instead of Wood Screws. 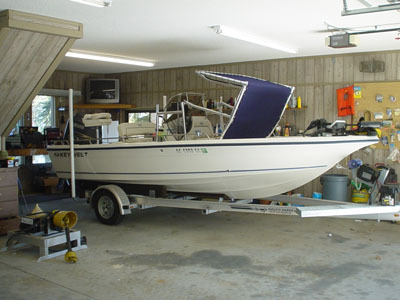 Due to the angles on the floor, and inconsistency between the various years of Boston Whaler® Montauk® 17, 170 and 19 hulls, the Fishmaster® T-Top may not fit properly, as it requires a flat floor to screw to. In addition, the Montauk’s foam filled floor prevents the owner from using any sort of backing plates and bolts for a sturdy installation. Instead, wood screws must be used. Thank you for your interest in Fishmaster. 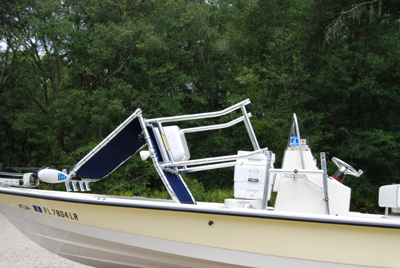 We designed the Fishmaster around the needs of owners of boats in the 17’ to 25’ range and in virtually all cases the deck is flat from bow to stern, especially around the console. 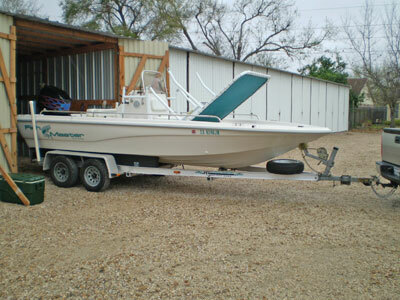 Soon after we began offering the T-Top we began receiving much interest from owners of 17’ Whalers and one of our first shipments was to a 1995 17’ Whaler owner. He was disappointed to learn that his boat was angled on the floor at the front of the console. If he moved the T-Top rearward the rear base was then a problem for accessing the seat. We looked at many options to solve this problem but ultimately he needed to return the T-Top as we could not determine an adequate solution promptly. 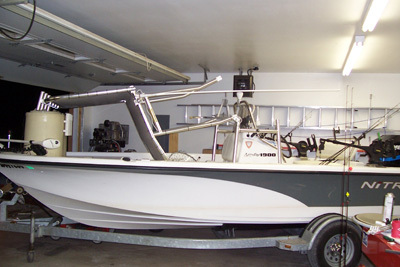 We have done much research on the 17’ Whaler taking to Boston Whaler support, at sites like continuouswave.com and other sites dedicated to Whaler owners, talking to owners, looking at pictures at boattrader.com and visiting many marinas gathering data about deck/floor configuration. Unfortunately the more information we obtained the more difficult the problem became to come up with a universal solution. 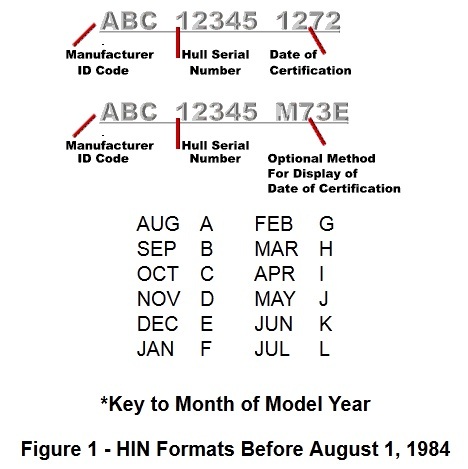 From 1976 to 2001 the design remained the same. The new design of 2002 is the same as what is made today. The idea was to create an adapter plate for the years this was an issue. Unfortunately field work and talking to various owners of 17’ Whalers has proven a much larger problem exists. 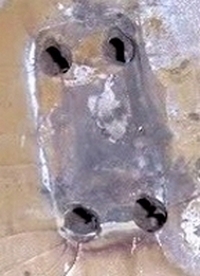 Although the hull changes above are documented, there were continual interior changes that were not documented anywhere. From one year to the next the console often changed in location or design, or both. The big problem we found was that many changes were made to the interior or deck with each hull design and this was never documented anywhere. 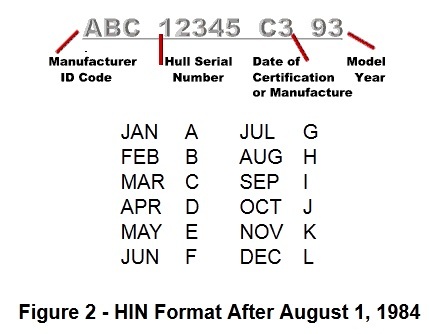 This means there is not a likely way to make a universal adapter or plate to address different floor configurations. 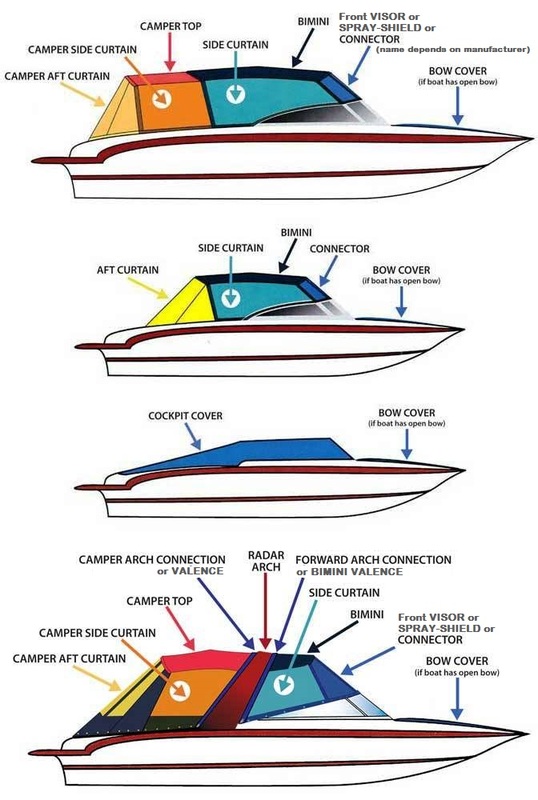 As a 17’ Whaler owner interested in a Fishmaster T-Top it is important that you review the dimensions of the Fishmaster T-Top (next page) and determine if your deck/floor is flat at the mounting locations. Unfortunately if it will not work we do not have a solution yet.